COLD SPRING, MN – Cold Spring Brewing Co. (CSBC), the #1 producer of exclusive beer and craft beer brands for major retailers throughout the world, is pleased to announce this month’s employee spotlight: Chad McCarney, Dayshift Production Manager. 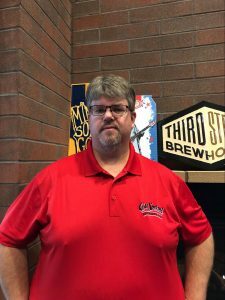 As a central Minnesota native, Chad has a deep familiarity with the long and rich tradition of the historic brewery in Cold Spring. This background is one of the reasons he was drawn to CSBC as a career. Chad began his role at CSBC in the Process Improvement department, and shortly thereafter took a position as Dayshift Production Manager. In this role, Chad has responsibility for all things happening in the main manufacturing plant. This includes scheduling employees’ time and equipment, maintaining a safe work environment by ensuring everyone follows procedures and policies, striving to produce products of the highest quality specifications and delivering products to fulfill customer orders. While Chad has only worked at CSBC for a few months, he says it has been a great opportunity for him to learn as he goes. Founded in 1874, Cold Spring Brewing Company has remained a fixture in the little Minnesota town that inspired its name for more than a century. Today, the company employs over 400 people throughout its brewery and beverage product development and production facility that includes Third Street Brewhouse. Third Street Brewhouse is a craft beer division of the company. Third Street’s year-round beers are available at liquor stores, as well as on tap at many bars and restaurants. Fan favorites include our craft staples Minnesota Gold Lager, Minnesota Gold Light, Hop Lift IPA, Lost Trout Brown Ale, Free Speech Red Ale and 2018 new product HULA Spiked Seltzer. They also enjoy seasonal and specialty beers including Sun Seeker Shandy, Hunny Do Wheat Beer and Cool Beans Imperial Coffee Porter.